Doncaster Rovers have confirmed a fourth and final friendly at the Keepmoat Stadium against Middlesbrough. The Teessiders will visit on Saturday, July 25 (3pm) - completing a testing pre-season schedule for Paul Dickov’s men. Last season’s losing Championship finalists also provide fitting opposition for Guisborough born James Coppinger, a boyhood Boro fan, in his testimonial year. Rovers have already announced warm-up games at home to Sunderland, Wolves and Nottingham Forest. 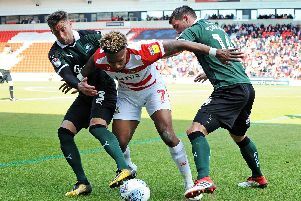 Forest will be Rovers’ first opponents, on Tuesday, July 21 (7.45pm), followed by Middlesbrough, Sunderland (Wed, July 29) and then Wolves (Sat, Aug 1) on the last weekend before the new Football League season gets underway. Rovers will also travel to Frickley Athletic on Wednesday, July 8.